A career with RNR Custom Wheels & Tires Midwest can provide a challenging and rewarding opportunity for individuals who have a strong desire to succeed. 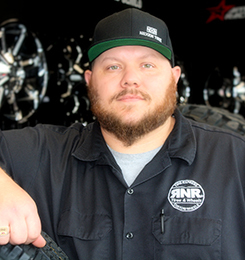 At RNR Custom Wheels & Tires Midwest, we aim to ensure our employees are able to achieve a healthy work-life balance. This value is reflected by our business hours: We’re open 9 a.m. to 6 p.m. on Monday through Friday and from 9 a.m. to 5 p.m. on Saturdays. All of our locations are CLOSED on Sundays, as well as on major holidays, including New Year’s Day, Memorial Day, Independence Day, Labor Day, Thanksgiving Day and Christmas. The memories made during time spent with family and friends are priceless. We wouldn’t dream of taking away from that enjoyment by presenting our employees with smaller paychecks to account for the holidays they have off. RNR Custom Wheels & Tires Midwest wants our team members to enjoy the holidays to their fullest! Employee health and wellness is of utmost importance to RNR Custom Wheels & Tires Midwest, which is why we provide peace of mind coverage for our team members and their families. Medical, dental, vision and life insurance programs become available to regular full-time employees on the first day of the month following 60 days of full-time employment. Other optional benefits include accident coverage, critical illness, long-term disability, short-term disability and additional life insurance. RNR Custom Wheels & Tires Midwest team members can officially take advantage of the company’s 401K program after one year of employment. We’re happy to match 30% of your first 5% and 40% of your next 5%. You’ll also enjoy around-the-clock account access and professionally managed investment fund choices in addition to lower taxable income (with our traditional 401K plan) as you’re building your retirement account. RNR Custom Wheels & Tires Midwest team members can purchase tires or wheels at cost beginning 90 days after hire. They’re also welcome to take advantage of our pay as you go program! If employed more than 90 days (but less than a year), they’ll enjoy a 4-month rental, and employees who have been with the team for more than 1 year will receive 6 months to pay off their tires. Employees can rent one set of tires at a time. At RNR Custom Wheels & Tires Midwest, we think of all of our employees as brand ambassadors and uniforms effectively build brand awareness. Uniforms are beneficial to the customer service experience in that they make our team members easy to identify. Plus, they provide a sense of team spirit, while saving team members the hassle of buying their own workplace apparel.